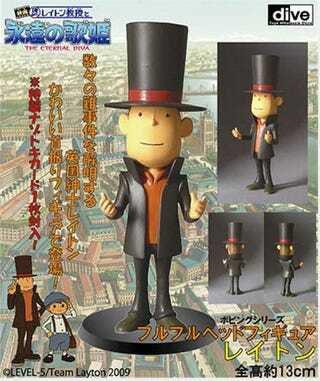 With a new Layton movie due out in Japan next month, it's time to start cashing in! And there's no better way than with a line of small, neat little action figures. These are "FuruFuru" figures, which basically means "bobblehead", only more subtle, with everyone's proportions in order. There are two available - the good Professor and Luke - and you can import them for just under $30 each. Steep, yeah, but on the bright side they're not asking you to solve any stupid match-stick puzzles in the checkout process.